Only a few minutes ago I was searching for the length of time that Arsenal FC had gone without silverware. Found this website , genius! 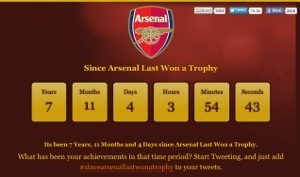 http://www.sincearsenallastwonatrophy.co.uk/ , well done guys!